Lodge Carron No 139 staged an Entered Apprentice degree at their Regular Meeting held on Wednesday 12th March 2014. After the ceremonial BroWilliam Campbell RWM was presented with a 50 years Jubilee Certificate by Bro Stuart Stirling PM in the presence of the RWPGM Bro Andrew A McKinnon and a deputation of his Provincial Grand Lodge colleagues. 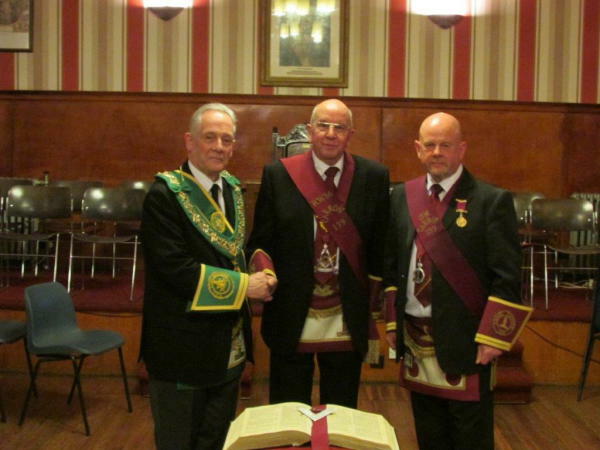 Pictured below from left tp right RWPGM Bro Andrew McKinnon, RWM Bro William Campbell, PM Bro Stuart Stirling.